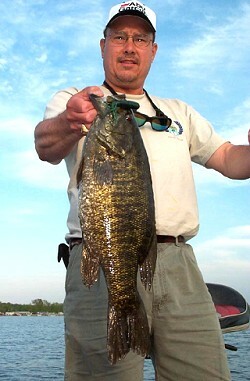 Smallmouth bass season usually opens the Saturday before Memorial Day, two weeks after the state wide walleye opener. Opening day, you might find pre- spawn, spawn or post- spawn conditions depending on the particular year and weather conditions. Some years the bass will be spawning and “locked” in on the nest, other years you might find pre spawn fish feeding to prepare for the stress of spawn. Because of Mille Lacs’s massive size, what you will usually find is a combination of pre- spawn, spawn and post-spawn fish all at the same time. Water temps and winds are the dictating factors. For example: I’ve seen fish move to the shallows, begin building nests and courting, only to have severe winds/weather come through (which muddies and cools the water) forcing the bass “pull out of the area”. It might take a week or so until the area settles down and for the spawning ritual to begin again. 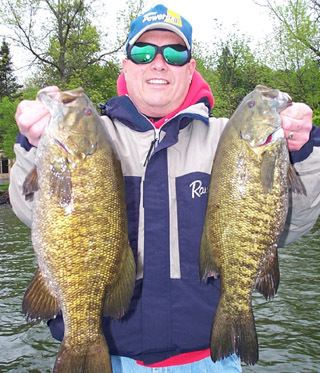 Mille Lacs smallmouth will spawn in water as shallow as a foot to 8-10 feet in depth. Popular lures for this time of year are lipless crankbaits (pre-spawn), hard and soft stick baits, tube jigs, spinner baits and finesse worms. This two week period is the toughest time of the year to pattern fish. Usually after the spawn the bigger females retreat to “no mans land” to recover from the stress of spawn. Locating big fish at this time can very challenging. The smaller males can be found and caught on the nest guarding the fry. The only tip that I may have for you, is to begin your search in the areas where the fish spawned the earliest. Common sense tells you these fish will get on their summer pattern earlier than their late spawning relatives. Mille Lacs is famous for its Mayfly, Midge and other lake bug hatches. The hatches can occur anytime from June to August. Bug hatches do influence the bite. Several times last year we got on fish pretty good and were very easy to pattern and catch….all of a sudden the bite would go cold literally overnight. The fish would disappear leaving the anglers scratching their heads in desparation. Usually within 24 hours of the beginning of the hatch the lake will start to show signs of dead bugs floating on the surface. These hatches are mother natures way of feeding the small young year classes that hatched in the spring as well as providing a easy meal for the larger fish. With a sudden abundance of food, bass and other spieces take advantage of this new source of forage and stuff them self with lake bugs….with stomach full of food there is no need for bass to chase lures or other fast moving baits. When this happens the angler must slow down their tactics and fish super slow….not slow, but super slow. This is my favorite time of the year to catch lots of smallmouth on Mille Lacs. Summer is when we see stable weather conditions (unlike spring); the fish become locked in on structure, and become very predictable. Typically two patterns exist on Mille Lacs. One pattern is to fish the shallow rock reefs scattered throughout of the lake. These rock reefs are very easy to find, simply look for the marker buoys and fish the rock reefs….its like connecting the dots. Popular lures to use are top water baits, like buzz baits and poppers, spinner baits, crank baits, soft plastic stick baits (Gulp sinking minnows), and tubes, spider grubs or any jig plastic combo that imitates a crayfish. When jig fishing the rocks, remember to keep the jig size as light as possible because heavier jigs get hung up more, be prepared to lose your fair share of jigs! Fish the tops early and late (low light) and the sides and breaks as the day progresses….remember the fish tend to school this time of year…so don’t get discouraged if you don’t catch anything for a period of time…keep plugging away and chances are you will run into a mess of brownies….and when you find them, you could have the time of your life….I have experienced catches of 50 to 100 fish a day. These reef fish tend to forage on crayfish and small perch. Later in the summer, large schools of young minnows 1 to 2 inches in size show up by the thousands, smallmouth being opportunist feeders, are quick to take advantage of these easy prey. The other summer pattern is a deep water pattern. You frequently hear walleye fishermen talk about catching smallmouth while walleye fishing in 10 to 25 feet of water. These fish are harder to locate, but I’m convinced there are huge schools of smallmouth that share the same deep water with the walleye. Most of these fish have never seen artificial bass bait! Good electronics are the key to finding the deep water fish. Deep cranking, drop- shoting and finesse jigs might be worth trying. As the leaves begin to fall, so do water temperatures. Cooling water triggers a major migration of yellow perch to the shallow weedy areas of Mille Lacs. Smallmouth bass begin to change their forage preference from crayfish to perch and other small fish. Nature is sending a message to these smallmouths to feed heavy, to add body mass in order to sustain them through the harsh winter ahead. Look to find smallmouth ambushing prey along weed edges in 3 to 10 foot of water. As an added bonus, don’t be surprised if you catch an occasional walleye, northern pike or musky. This is the time of year that all of the predators come together to share the same water in search of an easy meal. Spinner baits, small swim baits, chatter baits or small crank baits, jig n worms are a good choice. I use both spinning and bait casting equipment to catch smallmouths. I recommend a high modulus graphite spinning and casting rod with a fast tip between 6 1/2 and 7 feet in length. As far as “fishing string”, I use Berkley’s 100% fluorocarbon 8 pound test as a leader attached to 20 pound test (6lb diameter) Spiderwire Ultracast Invisi Braid or Berkley’s Nanofill for sinking baits like tubes and jigs. I use a double uni knot to attach the fluorocarbon leader to the Invisi-Braid. For non sinking baits Berkley’s Trans Optic is my choice for the remainder of my spinning/casting applications. For your bait casting reels, I use 10-14 lb Trans Optic for surface lures and crank baits. For spinner baits and buzz baits 65 lb Stealth Spider Wire or Spiderwire UltraCast Invisibraid is my choice. When fishing the rocks, it is imperative that a good pair of polarized sunglasses be worn, for my money Ocean Waves makes the very best polarized glasses.